There are dozens of organizations you could chose to donate your hard-earned money to tomorrow on what is referred to as ‘Giving Tuesday.’ My fiancé Eric and I are as generous as possible every year on this day as a way to counteract the insanity of Black Friday and Cyber Monday. You might say Giving Tuesday restores our faith in humanity just a little bit. If you’re somebody who is currently looking for a great foundation to give even a small donation, I highly suggest you start with Firefighter Behavioral Health Alliance. If your house catches on fire today, you want the fire department to show up, right? If you are in an automobile accident and seriously injured, you would want the fire department and EMS to show up and take care of you, huh? Exactly. That’s what we do; it’s a calling and we’re so glad to be able to help anyone in their time of need. What we do here at FBHA is help those in the fire service and EMS in their time of need. The better we feel, mentally and physically, the better we can come to your aid should you need to call 911 for an emergency. Should you choose FBHA for your Giving Tuesday charity, your donation would go a long way to help firefighters, EMTs, and Paramedics in your own community. Every 2.5 days according to current reporting statistics, we lose a firefighter or member of EMS to suicide in the US and Canada. We need your help to stop this trend. We’re a foundation formed out of necessity and are working day and night to better understand firefighter/EMS suicide with the nation’s only reporting service and using the information we learn to prevent other suicides. Captain Dill, our founder, treks across the country giving fantastic workshops to fire departments about bettering our brother’s and sister’s mental health and we work shoulder to shoulder with those struggling, the families left behind after suicide, and with those who want to make sure they stay mentally fit. After losing my Dad, Captain Mike Mauser, to suicide in January of this year, I began working with FBHA and can tell you there’s no better place to entrust your donation than with us. My Father was a firm believer in using the best tools of the trade to fight fire and save lives, but unfortunately he didn’t know the strongest tool he could ever use: Firefighter Behavioral Health Alliance. Me & My Dad during a hose ops class he was teaching, three months before his death. I thank you, from the depths of my heart, for considering FBHA for your Giving Tuesday donation. You can make your donation at any time by going to our website, ffbha.org. From everyone here at the Alliance, we send you warm wishes for a lovely and safe holiday season. Don’t forget to share this post with your colleagues and friends and be sure to check back for future posts! Keep up with all the news from FBHA on our Facebook page! You can interact with Lauren any time on Twitter using the handle @ClassyInCrisis and we encourage you to hashtag posts using #FBHA and #MauserStandard for things you’d like to share! With mental health and suicide gaining traction as a topic of discussion in the fire service and EMS, we’d like to take a moment of your time to share details about FBHA. While we are the first and only group collecting data on firefighter and EMS suicide, other organizations are looking to get involved and we’d like to share resources we have available and explain why we are considered an authority on suicide data reporting. Being the first organization to address firefighter suicide has not always been easy and we continue to face challenges today, but remain committed to our purpose for countless reasons, including survivor support. Many families who have lost a loved one in the fire service to suicide have faced feeling rejected and disrespected by organizations that deal with firefighter/EMS deaths from other situations, including line of duty deaths. While we understand each organization has a specific mission, and respect all organizations for their protocols, it should be noted that Firefighter Behavioral Health Alliance stands shoulder to shoulder with any family facing the loss of someone in the fire service. There is no situation too dark or too delicate for our assistance. We have stood firmly behind these principles even when it was much more difficult to talk about suicide and mental health in the firehouse, and will continue to do so. We are so thankful for other groups committed to bettering the health of first responders, especially those who have become partners with FBHA. To have others take up this fight with us is both flattering and empowering. We believe that we are stronger together and our exclusive reporting service is an important tool for all of our partner organizations. As I mentioned earlier, FBHA is the only organization in the world that collects data on firefighter and EMS suicide and is considered by leaders in the fire service across the US and Canada as the authority for suicide reporting. Every time a suicide is submitted to us for data collection (which can be done securely and anonymously on our website, ffbha.org) we sort through details and use it, along with the hundreds of other deaths we’ve confirmed, to provide feedback to EMS and fire officials. This is significant, because in order to stop these suicides, we must learn why they happen and share that information. While we keep information about all cases private, we are able to use what we learn to help others. We are dedicated to this task and are so glad to hear from those of you, far and wide, who support our efforts. Our founder, Jeff Dill, holds a Master’s degree, is a Licensed Counselor, member of the American Counseling Association, Illinois Counseling Association, Illinois Mental Health Counselors Association, and is a member of several firefighting organizations including the International Association of Firefighters and Illinois Firefighters Association. Because of his education, years of experience, and ability to successfully create workshops which educate those in the fire service and EMS about suicide, we have not only created a powerful organization, but also have become a catalyst for an entire movement. We are proud to be among those leading the charge to break down the stigma of mental illness in the fire service and happy to be the only organization collecting suicide reports on our brothers and sisters, no matter how difficult. We invite all of you, no matter where you are, to become participants in our work and take up this fight with us. Information is available at our website (www.ffbha.org), on our Facebook page, or on Twitter and we welcome you to drop an e-mail to us at anytime. We look forward to your support! As I write this article the holidays are upon us. According to an Andy Williams Christmas song,“This is the most wonderful time of the year”. Yet, for some firefighters out there it can be frustrating, scary and sometimes a very depressive time. For these brothers and sisters of ours it can turn into a tragic season. Just within the past week I have heard and/or read of three of our brothers who took their own lives. All that remains are the families and friends who are grieving and wondering why? Or, what could we have done to help? One of the main causes of suicides is depression, which does not show any discrimination. It doesn’t care about job titles, religion, race, age or gender. It weaves a web of destruction that causes chaos in the lives of those who are suffering from depression. Time and space restrict me from going deeper into explaining the many sides of depression. Here are signs and symptoms of depression according to The Diagnostic and Statistical Manual-IV (DSM-IV). They are weight loss, insomnia, restlessness or slowing down, fatigue, feelings of worthlessness or guilt, confusion and recurring thoughts of death. If you see a fellow firefighter (or anyone) with these signs or symptoms please have them seek out professional help. We are always protecting each other while on the fire-ground. My hope is that we can protect each other at all times. The angel shook her head slowly and said, “Six pairs of hands…..no way.” “It’s not the hands that are causing me problems,” God replied, “It’s the three pairs of eyes a medic has to have.” “That’s on the standard model?” asked the angel. “Lord,” said the angel, touching His sleeve, “rest and work on this tomorrow.” “I can’t,” God replied. “I already have a model that can talk a 250 pound drunk from behind a steering wheel without incident and feed a family of five on a private service paycheck.” The angel circled the model of the Paramedic very slowly. “Can it think?” she asked. “There’s a leak,” she pronounced. ” I told You that You were trying to put too much into this model.” “That’s not a leak.” God replied, “It’s a tear.” “What’s the tear for?” asked the angel. “It’s for bottled-up emotions, for patients they’ve tried in vain to save, for commitment to that hope that they will make a difference in a person’s chance to survive, for life.” “You’re a genius!” said the angel. “I DIDNT’ PUT IT THERE.” He said. I am not the author of this poem. And I could not find who authored it. But it speaks about my husband, the medics I fly with on the helicopter; Those that work on the ground for 24 hour shifts. It was pressed on my heart by our Lord to share it here on my blog because I know so many of you will relate. I got the poem from a Bible, The EMS Bible. This bible was given to my husband as gift from our pastor. During a time of trouble and illness, I had turned to our pastor for help. Prayer is powerful and it works. That is what I know. 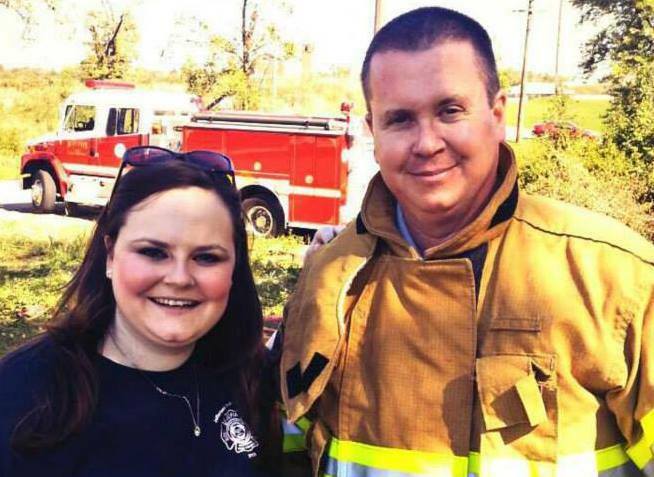 My husband was going through some kind of illness that can only be explained by only one thing; which is what his mind, body, and spirit has endured for 20 years in EMS. I want to someday share that story here on my blog in hopes that it will help one of you. Point out some things that may not be obvious to you but relevent. Or maybe a paramedic’s spouse will be prepared to intervene for their loved one. Because it defiantly took me by surprise that day. The day our lives changed. Because what happened to my husband could happen to yours. I wanted to know because I could sense the uneasiness. He was different that day; quiet, withdrawn, serious. He was being tormented by the memories and visions he had to soak in on his last shift. I remember I had asked him when he got home, “How was your shift?” as he put down his lunch pail and walked by me in the kitchen. He answered me using his usual one word answer “fine.” It wasn’t until a few days later I could sense the crushing. And that’s when I knew he was holding the secrets to pain, death, and the evils of this world. I want to help my husband. PLEASE DON’T FIGHT THOSE DEMONS ALONE, I thought to myself. As a flight nurse I can relate and understand the medical treatments. I know about grief. I know about fighting self-doubt and keeping the ‘what if’ scenarios from consuming your thoughts. When the outcome, in spite of your best efforts, is death of your patient the untruthful thoughts and self-doubt take control. “What if I would have got that IV sooner.” “what if I would have started that Levophed…” “What if I could have been there a few minutes sooner” But today I know that’s not what he is quietly fighting. It has nothing to do with self doubting or questioning a medical intervention. It goes far deeper than that. I have a feeling it’s the days after days…months after month….years after years of answering the call. He has a way about him when he starts that battle. Most post shift I can be part of his debrief because of this understanding I hold. And he’s the same for me post shift. We are each other’s confidant. We have each other’s support 110% and we are a great team together! We have flown together as partners in the transport environment on the helicopter. Not many husbands’ and wives’ can say that. We share a very special bond and have multiple relationships…..husband and wife, medic and RN, partners, co-workers, friends, study buddies, and mom and dad team to twins. I despise the fact that whatever he saw that shift is challenging his sense of self, safety, and trust. He no longer believes that life is predicable and just. I can confidently say he hasn’t thought life was predictable, and that this world is safe, since he was 15 years old. So I pray the prayers of the faithful wife and look to find understanding and peace for him. At dinner I watched him from across our table as he neatly folds his napkin and I realize that he folds it the exact same way every time. He is always in control and striving for perfection, down to the simplest task of folding his napkin. Does he feel that powerful sense to be flawless because of his experiences of a paramedic? Or is it that his impeccable attention to detail is the reason why he is so great at being a paramedic? I would dare say it’s the latter of the two. He is the strongest and most confident person that I know…. I trust him with my life. If you are ever his patient, trust him, too. He holds the knowledge and the skills to save you. There is no doubt. I don’t say that just because he’s my husband. I say that because I have seen him firsthand because I have had the honor to fly bedside him as a partner. Jeff and I agree that my focus will be on EMS. This organization’s main objectives was focused on reporting Firefighter/Paramedic suicide. But Jeff does not want the EMS not affiliated with fire to be forgotten. This organization knows that EMS suicides are not being reported for his data collection due to many not knowing that this support system exists. He wants my help! I will help by posting in this blog that is now being read world wide. There is definitely a lack of knowledge about this particular organization. I, myself, researched in hopes of finding an organization similar to this one. I asked experienced paramedics. I searched the internet. When I came up empty handed I felt a calling that this issue of PTSD involving EMS needed to be addressed. So I thought creating a foundation of my own was the answer. Therefore, I started a fund. Many generous people that saw my same vision donated in an effort to help me get started. The total donation total was $230 to my fund! I was humbled. So, I gave all those that donated to my fund an option of a refund after I disclosed that I would instead be joining a non-profit with our vision. They did not want their money back. Instead, I will be not only donating the $230 but I am matching it! So a total of $460 will be going to this organization. Please take a moment to check out this organization. And if you have known someone in EMS that has taken their life recently….check out the reporting system. Please help us help those that help others! So many people were expected at my Dad’s services that we rented a beautiful local community center for his visitation and funeral. I still find myself having a hard time remembering everyone who came to pay their respects. I made it a point to stand at his casket for nearly all of his eight-hour visitation and speak to every firefighter about FBHA. I also spoke about the Alliance during my eulogy, in an attempt to keep this from happening to someone else. I know that everyone there heard me, but one person in particular took what I said to heart. I hadn’t ever met Mark Adkins until a few weeks after Dad died. Mark sent me a message saying he’d like to run the half Flying Pig Marathon in Cincinnati in full turnout gear to raise awareness for FBHA in memory of Dad. I was beyond shocked. After my fiancé Eric and I met with Mark for dinner, it felt like we’d always known him. With Mark being a firefighter in Northern Kentucky, we’d had many similar experiences and knew many of the same people. Funny part is, as much as those things made me already feel like he was a friend, it was many of the personal stories he told us, and his genuine desire to spread the message of FBHA, that made him feel like a brother. In the months following that dinner, I kept up with Mark as he trained for the Pig. Week by week, he added a little more of his gear to his rigorous training schedule and began running different courses, much of which included running from firehouse to firehouse. It was really inspiring to see Mark get stronger, even in some pretty awful weather, and to see him get mentally pumped-up for the race. When he’d get to a destination firehouse, the crews there would provide him with drinks and a place to cool down, which was kind of poignant, to me, anyway, seeing as that brotherhood was the reason behind all this effort. I can also tell you Mark never ran alone: my Dad was always with him. A couple weeks before the race, I thought it would be great if we could get a local print publication or TV news crew to cover the story of Mark running. I applied a relentless campaign of Tweets, e-mails, and submission of online requests. I heard nothing, for a few days, and was genuinely sad we’d gotten no replies, despite having some connections to local news reporters. Then, just as I’d given up, my e-mail made its way to WLWT Channel 5 Executive Producer Jon Carlisle. Mr. Carlisle sent me a heartfelt e-mail back, in which he told me how thankful he was I had been so honest with him, how he was so glad to hear my story, and him telling me WLWT would be beyond honored to cover this story. I’ll be honest; I cried. I sat right where I’m sitting now, and just cried. I am not a pretty crier mind you; I have big tears, my nose runs a lot, and I’ve got a perforated septum so I make this weird whistle noise when I’m breathing heavy (the things I admit in attempts to be totally honest…), but it all just came out because it felt like now this might be a big deal. And, well, I was crying because it felt like my Dad would have thought this was awesome. We met with a cameraman and the very talented and kind reporter Kyla Woods at Central Campbell firehouse a few days later to tape a segment which would play several different times that evening and the next morning. My fiancé Eric and cousin Melanie accompanied me to the station and my interview was taped first. I’m a decent public speaker and had gone through media training before, so I knew what to expect. Mark was a little more nervous and a hug that was played on-air later was just me genuinely trying to make him feel more comfortable. I was, and am, so proud of what he did and his interview was great. If you’d like to see the full segment, you can check it out here on WLWT. The night before the race finally came and I had an idea while I was on Twitter. I thought it would be cool if I could ask firefighters across the country to send Mark a message of encouragement and then I’d make him a map with the supporter’s locations. I stayed up all night, giggling with wild abandon (which is a nice way of me saying I laughed so hard I snorted), each time I got a reply Tweet. By the time we left for the race at the crack of dawn, dozens of our brothers and sisters from across the country were part of #TeamMark. We met up with Mark’s family to watch him at the beginning of the race in Newport, Kentucky and we were all so excited. I have to admit watching the huge crowd of runners come across a large bridge from Cincinnati into Northern Kentucky was impressive, but the most powerful image was Mark in his gear. You know how movies have those impressive, iconic moments where a hero emerges from the rubble after some crazy explosion? This was one of those moments. In the pale morning light with fog rising off the river, a hero emerged right before our eyes. After Mark lapped back towards Cincinnati, we all hopped in our cars (I feel 100% lazy saying that!) so we could watch him at the finish line. Trevor Runaway, a younger firefighter with Campbell County, was running with Mark, which made us all feel a little relief knowing someone was keeping an eye on him. News crews from every station in Cincinnati were tracking Mark and Trevor’s progress and famous runners who were commentators for the race told viewers how impressed they were by Mark’s athleticism. Firefighters and their families from across the city were sending us texts exclaiming they’d seen Mark on TV and he looked great. As Mark came down that last corner to the finish line and saw all our signs, he got this smile on his face that was priceless. It was the coolest damn thing I’ve ever experienced. The reason I’m telling you this story is because on Saturday (October fourth) Mark, Captain Dill, and I are receiving the Hometown Hero Award from the University of Cincinnati during their game at Paul Brown Stadium. We are so honored to have been selected and can’t wait to share the message of FBHA with everyone watching the game Saturday. We’re incredibly thankful to UC for allowing us to be a part of such a great event and for believing first responder mental health is as important as we do. I’m going to leave you with a quote again today, just like last time. I think you’ll like it. Don’t forget to share this post with your colleagues and friends and be sure to check back for future posts! Like us on Facebook to keep up with FBHA news. You can interact with me any time on Twitter using the handle @ClassyInCrisis and we encourage you to hashtag posts using #FBHA and #MauserStandard for things you’d like to share!